Synergistic cytotoxic effect of sodium dichloroacetate combined with chemotherapeutic drugs on B16F10 murine melanoma cell line. The incidence of skin cancer has increased dramatically in recent decades, particularly melanoma. In this study, the cytotoxic effects of sodium dichloroacetate (DCA) in combination with chemotherapeutic drugs such as doxorubicin (DOX) and cisplatin (CIS) were evaluated. In vitro, B16F10, macrophages, and murine erythrocytes were treated with DCA (ranged from 3.66 × 104 to 3.66 × 105 μmol/L), DOX (1.38 × 10-4 to 1.38 × 10-3 μmol/L) and CIS (0.16 to 1.28 μmol/L) alone or in combination and were incubated for 72 h. Cell viability and hemolysis were determined by the MTT method and released hemoglobin, respectively. The results obtained on B16F10 cells indicate that the treatment with DCA alone showed a half-maximal inhibitory concentration (IC50) of 1.49 × 105 μmol/L, DOX caused an IC50 of 1.12 × 10-4 μmol/L and CIS-induced an IC50 of 1.14 μmol/L. Combinations of treatments with IC50 of DCA+CIS or DCA+DOX resulted in significantly decreased cell viability by 60 and 95%, respectively. Finally, the treatments alone or in combination did not cause lysis of murine erythrocytes and did not affect the cell viability of macrophages. Our results suggest that DCA enhances cytotoxicity induced by CIS or DOX on B16F10 cells without affecting erythrocytes and macrophages integrity. In recent years, the incidence of skin cancer has increased considerably, particularly melanoma. Although melanoma is the least frequent skin cancer, accounting for only 1% of all cases, is highly aggressive and the mortality rate has increased significantly in the last years, due to the occurrence of metastases that resists conventional therapies [1-3]. In this manner, in the United States, melanoma was the third most common type of skin cancer, more than 91,270 new cases were diagnosed, of which 9,320 died and a melanoma rate of 2.6 per 100,000 was reported . The main environmental factor that increases the risk the development of melanoma is the exposure to ultraviolet radiation, which can induce abnormalities in the genetic pathways and cause an unregulated cell growth of melanocytes . Also, it has been mentioned that the origin of cancer cells can be related to metabolic alteration, such as mitochondrial increase of glycolysis, which largely depends on this metabolic pathway needed to convert glucose into pyruvate, for the generation of ATP to meet cancer cell energy needs . Many cancer cell types produce ATP by conversion of glucose to lactate in the presence of oxygen and exhibit lower oxidative phosphorylation. The glycolytic phenotype is known as aerobic glycolysis or the “Warburg effect” . Therefore, the search for new drugs plays an important role in cancer treatment. Sodium dichloroacetate is a pyruvate dehydrogenase kinase inhibitor and is able to reverse the Warburg effect by shifting ATP production back to oxidative phosphorylation, the restoration of the mitochondrial processes consequently induces apoptosis in some cancer cell lines such as breast, prostate, colorectal, lung and endometrial cancers [8,9]. However, a few studies have been conducted on the pharmacological interaction with sodium dichloroacetate and chemotherapeutic drugs on melanoma cells. Due to this reason, in the present study, we investigated the cytotoxic potential of sodium dichloroacetate in combination with doxorubicin or cisplatin in B16F10 murine melanoma cell line as well as toxicity in normal cells such as peritoneal macrophages and erythrocytes. The sodium dichloroacetate (150.92451 M.W.) was purchased from Sigma Aldrich (St. Louis, MO, USA), cisplatin (Blastolem RU®) and doxorubicin (Doxolem RU®) were obtained from Medical Pharmacy MD (Monterrey, N.L., Mexico). Subsequently, all drugs were filtered (0.2 µm of diameter, Millipore, USA) and dissolved in Dulbecco’s modified Eagle's medium (DMEM/F-12) (Life Technologies Gibco, Grand Island, NY, USA). B16F10 murine melanoma cell line was purchased from American Type Culture Collection (ATCC, Manassas, VA, USA) and was maintained in DMEM/F-12 supplemented with 10% fetal bovine serum (FBS) and 1% antibiotic-antimitotic solution (Sigma Aldrich, St. Louis, MO). Cells were exponentially growing at 37°C, and 5% CO2 atmosphere. Resident peritoneal cells were obtained from 6-8 weeks old female C57BL/6 mice maintained in a controlled environment at 25°C (12 h light/dark cycles) with free access to food and water. The mice were sacrificed by cervical dislocation, and resident peritoneal macrophages were obtained by peritoneal lavage with ice-cold DMEM/F-12 culture medium, according to protocols approved by the Institutional Animal Care and Use Ethics Research Committee of Faculty of Chemistry of the Autonomous University of Coahuila with registration number 102/2017. The results were used to plot a concentration-response curve by linear regression to determinate the DCA, DOX or CIS concentrations that inhibited 50% of the cell population (IC50). Data are presented as the percentage of viability ± standard deviation. We first determined the IC50 values of DCA, DOX, and CIS for B16F10 cell line. Drug concentrations ranged from 1.38 × 10-4 to 3.66 × 105 μmol/L for the single-drug treatment. To determine the pharmacological interaction between the DCA and the chemotherapeutic drugs, the B16F10 cells were seeded as described above, and were added the IC50 of DCA and simultaneously treated with IC50 of DOX or CIS. In the same manner, to determine whether DCA in combination with chemotherapeutic drugs induce cytotoxicity in macrophages, the IC50 of DCA plus IC50 of the chemotherapeutics agents obtained in B16F10 cells assay were applied in peritoneal macrophages culture and incubated for 72 hours. Finally, the MTT assay was performed to evaluate cell viability. For morphological analysis, B16F10 and macrophages treated with DCA in combination with chemotherapeutic drugs were directly observed in the culture plates using an inverted optical microscope (Leica DMIL, USA) and photographs were taken with an attached camera. All experiments were performed in triplicate and data are representative of three independent experiments. Statistical analysis was obtained using the analysis of variance (ANOVA) followed by Dunnett’s tests using the GraphPad Prism 5 (San Diego, USA, 2007). The results were considered statistically significant if the *p-value was <0.05. In the study, we showed that treatments with DCA, DOX and CIS significantly affected the viability of B16F10 cell. In this manner, DCA affected the cell viability (1.10 × 105 μmol/L (75.84%), 1.47 × 105 μmol/L (44.70%), 1.83 × 105 μmol/L (34.72%), 2.20 × 105 μmol/L (22.19%), 2.56 × 105 μmol/L (9.22%), 2.93 × 105 μmol/L (5.40%), 3.30 × 105 μmol/L (2.97%)), and DCA caused 100% of toxicity on B16F10 cells at the concentration of 3.66 x 105 μmol/L. 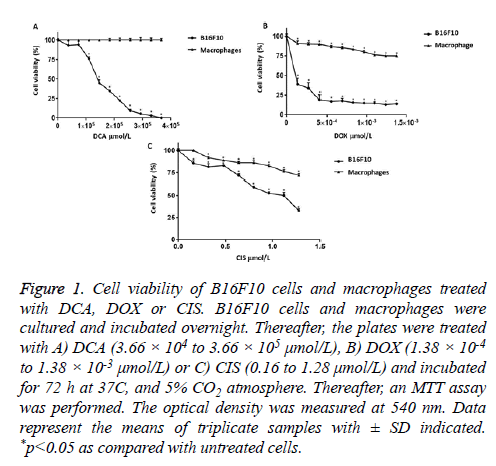 However, DCA in concentrations of 3.66 × 104 μmol/L and 7.32 × 104 μmol/L did not significantly affect the viability percentage of the B16F10 cells (93.01% and 93.92%, respectively) (Figure 1A). On the other hand, DOX treatments induced a significant decreased the viability (1.38 × 10-4 μmol/L (38.70%), 2.76 × 10-4 μmol/L (33.79%), 4.14 × 10-4 μmol/L (18.92%), 5.52 × 10-4 μmol/L (17.04%), 6.90 × 10-4 μmol/L (17.64%), 8.28 × 10-4 μmol/L (15.42%), 9.66 × 10-4 μmol/L (14.77%), 1.10 × 10-3 μmol/L (14.67%), 1.24 × 10-3 μmol/L (12.84%) and 1.38 × 10-3 μmol/L (13.90%) compared to untreated cells (100%)) as shown in Figure 1B. In the case of CIS (Figure 1C), we found concentration-dependent effects (0.16 μmol/L (85.54%), 0.32 μmol/L (81.47%), 0.48 μmol/L (82.92%), 0.64 μmol/L (71.78%), 0.80 μmol/L (59.15%), 0.96 μmol/L (52.47%), 1.12 μmol/L (50.06%) and 1.28 μmol/L (32.63%)). Interestingly, DCA did not affect the viability of peritoneal macrophages (Figure 1A), while DOX and CIS decrease approximately 25% of the viability of murine macrophages (Figures 1B and 1C, respectively). 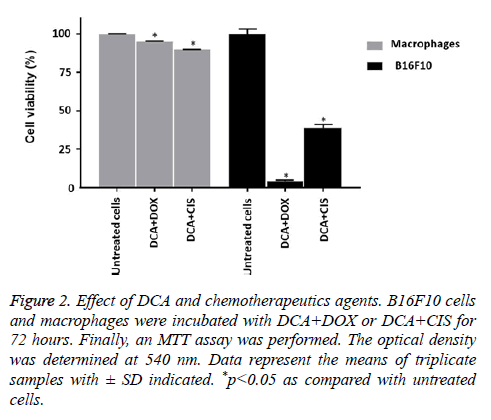 Figure 1: Cell viability of B16F10 cells and macrophages treated with DCA, DOX or CIS. B16F10 cells and macrophages were cultured and incubated overnight. Thereafter, the plates were treated with A) DCA (3.66 × 104 to 3.66 × 105 μmol/L), B) DOX (1.38 × 10-4 to 1.38 × 10-3 μmol/L) or C) CIS (0.16 to 1.28 μmol/L) and incubated for 72 h at 37C, and 5% CO2 atmosphere. Thereafter, an MTT assay was performed. The optical density was measured at 540 nm. Data represent the means of triplicate samples with ± SD indicated. *p<0.05 as compared with untreated cells. Based on the linear regression equation obtained of the single treatments on B16F10 cells, the IC50 for DCA, DOX and CIS were determined in 1.49 × 105 μmol/L, 1.12 × 10-4 μmol/L, and 1.14 μmol/L, respectively (Table 1). Then, the combinations with IC50 of the treatments were performed. The results demonstrated that DCA+CIS and DCA+DOX caused a greater decrease in cell viability, maintaining only 38.75% and 4.19% of live cells, respectively, compared to the single treatments. Conversely, macrophages treated with the combination of DCA+CIS showed 87.45% of viable cells, and similarly, DCA+DOX maintains 94.75% of live cells (Figure 2). IC50 values were determinate using linear regression (R2>0.9). They are presented as mean ± SD from at least three independent experiments. Table 1: IC50 values obtained for DCA, DOX and CIS against B16F10 melanoma cells determined by MTT assay. Figure 2: Effect of DCA and chemotherapeutics agents. B16F10 cells and macrophages were incubated with DCA+DOX or DCA+CIS for 72 hours. Finally, an MTT assay was performed. The optical density was determined at 540 nm. Data represent the means of triplicate samples with ± SD indicated. *p<0.05 as compared with untreated cells. In the case of untreated B16F10 cells have prolongations and moderate pleomorphism (Figure 3A). Numerous dead B16F10 cells were observed with the treatment of DCA+DOX and DCA+CIS (Figures 3B and 3C, respectively). These results demonstrate that the DCA and the chemotherapeutics used in this research have a synergistic effect. On the other hand, macrophages treated with the combination of DCA and chemotherapeutic drugs did not cause apparent morphological alterations (Figures 3E and 3F, respectively) in comparison with the untreated cells (Figure 3D). 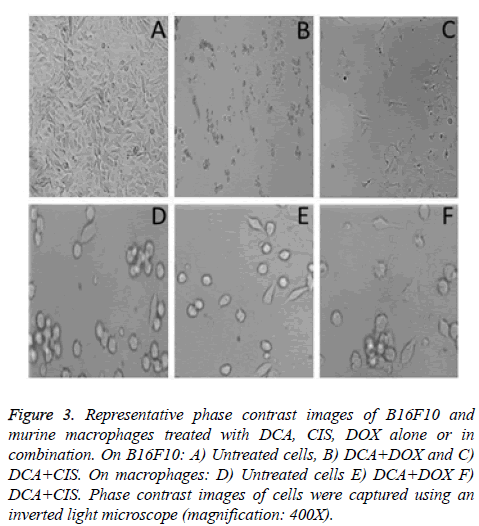 Figure 3: Representative phase contrast images of B16F10 and murine macrophages treated with DCA, CIS, DOX alone or in combination. On B16F10: A) Untreated cells, B) DCA+DOX and C) DCA+CIS. On macrophages: D) Untreated cells E) DCA+DOX F) DCA+CIS. Phase contrast images of cells were captured using an inverted light microscope (magnification: 400X). DCA in the concentrations of 3.66 × 104 to 3.66 × 105 μmol/L did not cause statistically significant hemolytic effects (3.66 × 104 μmol/L (0.43%), 1.10 × 105 μmol/L (3.72%), 1.83 × 105 μmol/L (4.44%), and 3.66 × 105 μmol/L (4.70%)) (Figure 4A). Similar results were found with DOX (1.38 × 10-4 μmol/L (5.45%), 4.14 × 10-4 μmol/L (5.60%), 6.90 × 10-4 μmol/L (5.70%), and 1.38 × 10-3 μmol/L (5.85%)) (Figure 4B). On the other hand, CIS induced hemolytic effects only in the concentrations of 0.64 μmol/L (7.04%), and 1.28 μmol/L (8.09%) in comparison to the negative control (Figure 4C). Figure 4: Hemolytic activity of DCA and chemotherapeutics agents. Murine erythrocytes were exposed for DCA, DOX or CIS for 24 hours. Finally, as a measure of hemolysis, the percentage of hemoglobin released from the supernatant was determinate photometrically at 415 nm. A) DCA, B) DOX, C) CIS. Data are presented as a mean ± SD, *p<0.05. Only the combination of DCA+CIS showed significant hemolytic effects (23.73%). On the contrary, the combination of DCA+DOX did not causes significant hemolysis (1.66%) compared to the negative control (Figure 5). Figure 5: Hemolytic activity of DCA and chemotherapeutics agents. 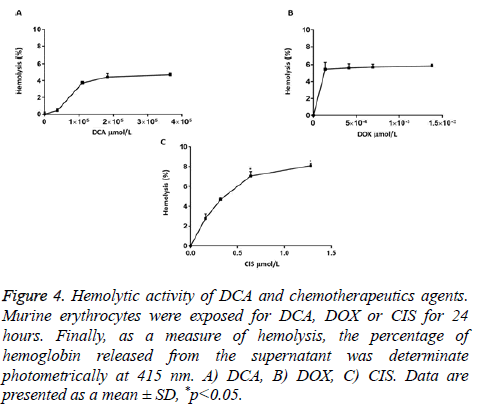 Erythrocytes murine were exposed for DCA+DOX or DCA+CIS for 24 hours, as a measure of hemolysis, the percentage of hemoglobin released from the supernatant was determinate photometrically at 415 nm. Data are presented as a mean ± SD, *p<0.05 compared to the negative control. Now-a-days, melanoma is responsible for the most deaths of all skin cancer, occurs in young people and adults (aged 15-39 years). It is estimated that annually, $3.3 billion in costs of skin cancer treatment is attributable to melanoma . One of the main problems of melanoma is the high metastatic potential causing dissemination of tumor cells towards lung, liver, and brain. Although there are several chemotherapeutic agents to fight melanoma, such as DOX and CIS, the effectiveness is limited due to the toxicity to other organs in the body by the interaction of the drug with normal cells such as hair follicle, skin, reproductive, digestive tract and blood cells [11,12]. Side effects of chemotherapy include nausea, vomiting, fatigue, alopecia and cardiac, renal and hematological toxicity . On the other hand, Warburg effect contributing to the invasive properties of cancer cells and resistance to common anticancer agents . DCA, as a pyruvate dehydrogenase kinase inhibitor, can reverse the Warburg effect, some studies have shown anti-cancer properties in several cancer cell lines such as HepG2, HCC-LM3 and SMMC-7721 (hepatocellular carcinoma line cells) at 20 mmol/L [15,16], RPMI8226, U266, JJN-3, NHC-H929 and LP-1 (myeloma cells) at 25 mmol/L , NTera-2 (testicular cancer), U2OS (osteosarcoma), A549 (lung cancer), MCF-7 (breast cancer) at 20 μmol/L, PC3 and DU145 (prostate cancer) at 5 mmol/L , PTJ64 and PTJ86i (paraganglioma cells) at 50 mmol/L . However, there is limited information about the effect of DCA on melanoma cell lines, for example, Abildgaard et al. showed that DCA at concentrations of 0.5 to 100 mmol/L reduced the cell proliferation of several melanoma cell lines (ED-007, ED-070, ED-179, ED-196, and SK-MEL-28) in a concentration-dependent manner . In addition, Populo et al. reported that DCA induced an IC50 values at 33 mmol/L and 53 mmol/L in Mewo and A375 melanoma cells, respectively . Our results demonstrated that the treatment with DCA alone caused a 100% decrease in B16F10 cells with a concentration of 3.66 × 105 μmol/L. Similarly, other investigations have found that DCA at a concentration of 5 μmol/L provokes a reduction of 40% in the HBL human melanoma line . DCA has been extensively studied for the treatment of congenital lactic acidosis in mitochondrial diseases [23,24] and has been demonstrated that DCA is a safe drug with no cardiac, pulmonary, renal, or hematologic toxicity . Similarly, in this work, DCA did not produce cytotoxic effects in murine macrophages and erythrocytes. Similar to DCA, DOX induces a decrease of 86% in the B16F10 viability at concentrations ranging from 4.14 × 10-4 to 1.38 × 10-3 μmol/L. Finally, CIS was able to reduce cell viability at ~67%, with a concentration of 1.28 μmol/L. Other investigations have found an IC50 value of cisplatin in NTera-2 (0.043 μmol/L), Hela (1.2 μmol/L), and U2OS (3.9 μmol/L) cancer cell lines . One of the main problems with the clinical use of chemotherapeutic agents such as DOX, and CIS is the development of drug resistance due to the repeated administration of increasing doses of these drugs may, therefore, cause therapeutic failure. For this reason, several works have shown that the combined use of drugs with cytotoxic potential acting on distinct cellular targets to decrease the dose of each individual drug to induce a synergistic or additive effect and enhancing the antitumor activity . Therefore, based on the promising antitumor activity of DCA, we evaluated the combinations of this molecule with chemotherapeutic agents such as DOX, or CIS showed a synergistic effect on cell death in the B16F10 cell line. Similar to our results, a formulation denominated mitaplatin (consisting of DCA+CIS) affected the tumor cells by two action pathways: DCA caused mitochondrial damage, and CIS inhibited DNA synthesis by cross-linking the chains of the genetic material on HeLa and A549 cell lines, cervical and lung cancer, respectively at a concentration of 10 μmol/L . In another case, the combined DCA (5 mmol/L) and CIS (0.13 mmol/L) in PC3 and DU145 cancer cell lines dramatically decreased the cell viability in comparison with single drug treatment . Moreover, Florio et al. showed that the combined treatments with DCA (10 mmol/L) and metformin (15 mmol/L) caused a greater reduction of paraganglioma cell viability as compared to the effect of single agents. In other investigation, DCA (1 mmol/L) and vemurafenib (50 nmol/L), significantly decreased the cellular growth of ED-117 and ED-196 melanoma cell lines . In another case, the combination of DOX and lovastatin showed synergistic cytotoxic effects on human melanoma cells B16F10, B78, A-375 y Hs 294T . Also, the treatment with 0.5 mmol/L DCA plus 300 nmol/L of elesclomol caused a pro-oxidative effect inducing the death of A375 human melanoma cells . Our findings indicate that DCA+CIS or DCA+DOXO combinations did not affect the viability of murine peritoneal macrophages. Similar results have been found with DCA at a concentration of 20 μmol/L in the normal cell line human fetal lung (MRC-5), only induced 1.8% of cell death. However, they found that chemotherapeutic agents caused lymphopenia and a significant decrease in the number of murine peritoneal macrophages . Our results also showed that CIS and DOX affected the cell viability of murine macrophages. Besides, we evaluated the effect of drugs on erythrocytes, because anticancer drugs are usually administered intravenously. Our results indicate that treatment with alone DCA or DOX did not induce hemolysis in murine erythrocytes, although CIS, with the concentration of 1.28 μmol/L caused significant hemolysis (8%) as compared to the negative control. Similar results have been reported, finding that CIS at 13.33 μmol/L induced hemolysis in isolated chicken erythrocytes (14%) . However, CIS in a concentration of 0.33 μmol/L did not cause damage to human erythrocytes . In conclusion, DCA significantly enhances the DOX and CIS cytotoxicity in melanoma cells, without affectation of murine macrophages and erythrocytes. Our findings suggest that the combination of DCA+DOX could be used to improve the treatment of melanoma. However, more studies in vitro and in vivo are necessary to understand the mechanism of action as well as to evaluate the side effects of combinations of drugs after short and long-term administration and cytotoxic efficacy on melanoma cancer. The authors would like to thank the Coordinación General de Estudios de Posgrado e Investigación (CGEPI) of UAdeC for their support. This research was supported by the grant from “Fondo Destinado a Promover el Desarrollo de la Ciencia y la Tecnología (FONCYT) and Consejo Estatal de Ciencia y Tecnología (COECYT)” with research grant number COAH-2017-C12-C155. Khoobchandani M, Ganesh N, Gabbanini S, Valgimigli L, Srivastava MM. Phytochemical potential of Eruca sativa for inhibition of melanoma tumor growth. Fitoterapia 2011; 82: 647-653. Cruz e Carvalho A, Márquez CA, Azevedo RB, Joanitti GA, Pires Júnior OR, Fontes W, Castro MS. Cytotoxic activity and antiproliferative effects of crude skin secretion from Physalaemus nattereri (Anura: Leptodactylidae) on in vitro melanoma cells. Toxins (Basel) 2015; 7: 3989-4005. Baharara J, Amini E, Nikdel N, Salek-Abdollahi F. The cytotoxicity of dacarbazine potentiated by sea cucumber saponin in resistant B16F10 melanoma cells through apoptosis induction. Avicenna J Med Biotechnol 2016; 8: 112-119. World Health Organization (WHO). How common is skin cancer? WHO 2018. DOrazio J, Jarrett S, Amaro-Ortiz A, Scott T. UV radiation and the skin. Int J Mol Sci 2013; 14: 12222-12248. Bhat TA, Kumar S, Chaudhary AK, Yadav N, Chandra D. Restoration of mitochondria function as a target for cancer therapy. Drug Discov Today 2015; 20: 635-643. Gatenby RA, Gillies RJ. Why do cancers have high aerobic glycolysis? Nat Rev Cancer 2004; 4: 891-899. Wong JY, Huggins GS, Debidda M, Munshi NC, De Vivo I. Dichloroacetate induces apoptosis in endometrial cancer cells. Gynecol Oncol 2008; 109: 394-402. Garon EB, Christofk HR, Hosmer W, Britten CD, Bahng A, Crabtree MJ, Hong CS, Kamranpour N, Pitts S, Kabbinavar F, Patel C, von Euw E, Black A, Michelakis ED, Dubinett SM, Slamon DJ. Dichloroacetate should be considered with platinum-based chemotherapy in hypoxic tumors rather than as a single agent in advanced non-small cell lung cancer. J Cancer Res and Clin Oncol 2014; 140: 443-452. U.S. Department of Health and Human Services (HHS). The Surgeon Generals Call to Action to Prevent Skin Cancer. Washington, DC: U.S. Office of the Surgeon General 2014. Wang Y, Probin V, Zhou D. Cancer therapy-induced residual bone marrow injury-Mechanisms of induction and implication for therapy. Curr Cancer Ther Rev 2006; 2: 271-279. Boussios S, Pentheroudakis G, Katsanos K, Pavlidis N. Systemic treatment-induced gastrointestinal toxicity: incidence, clinical presentation and management. Ann Gastroenterol 2012; 25: 106-118. Zhu J, Liu R, Jiang Z, Wang P, Yao Y, Shen Z. Optimization of drug regimen in chemotherapy based on semi-mechanistic model for myelosuppression. J Biomed Inform 2015; 57: 20-27. Yeluri S, Madhok B, Prasad KR, Quirke P, Jayne DG. Cancers craving for sugar: an opportunity for clinical exploitation. J Cancer Res Clin Oncol 2009; 135: 867-877. Dhar S, Lippard SJ. Mitaplatin, a potent fusion of cisplatin and the orphan drug dichloroacetate. Proc Natl Acad Sci USA 2009; 106: 22199-22204. Dai Y, Xiong X, Huang G, Liu J, Sheng S, Wang H, Qin W. Dichloroacetate enhances adriamycin-induced hepatoma cell toxicity in vitro and in vivo by increasing reactive oxygen species levels. PLoS One 2014; 9: 92962. Sanchez WY, McGee SL, Connor T, Mottram B, Wilkinson A, Whitehead JP, Vuckovic S, Catley L. Dichloroacetate inhibits aerobic glycolysis in multiple myeloma cells and increases sensitivity to bortezomib. Br J Cancer 2013; 108: 1624-1633. Zeng S, Liang H, Guan G. Dichloroacetate enhances the cytotoxic effect of cisplatin via decreasing the level of FOXM1 in prostate cancer. Int J Clin Exp Med 2016; 9: 11044-11050. Florio R, De Lellis L, Veschi S, Verginelli F, Di Giacomo V, Gallorini M, Perconti S, Sanna M, Costantini R, Natale A, Arduini A, Amoroso R, Cataldi A, Cama A. Effects of dichloroacetate as single agent or in combination with GW6471 and metformin in paraganglioma cells. Sci Rep 2018; 8: 13610. Abildgaard C, Dahl C, Basse A, Ma T, Guldberg P. Bioenergetic modulation with dichloroacetate reduces the growth of melanoma cells and potentiates their response to BRAF V600E inhibition. J Transl Med 2014; 12: 247. Pópulo H, Caldas R, Lopes J, Pardal J, Máximo V, Soares P. Overexpression of pyruvate dehydrogenase kinase supports dichloroacetate as a candidate for cutaneous melanoma therapy. Expert Opin Ther Targets 2015; 19: 733-745. Kluza J, Corazao-Rozas P, Touil Y, Jendoubi M, Maire C, Guerreschi P, Jonneaux A, Ballot C, Balayssac S, Valable S, Corroyer-Dulmont A, Bernaudin M, Malet-Martino M, de Lassalle EM, Maboudou P, Formstecher P, Polakowska R, Mortier L, Marchetti P. Inactivation of the HIF-1?/PDK3 signaling axis drives melanoma toward mitochondrial oxidative metabolism and potentiates the therapeutic activity of pro-oxidants. Cancer Res 2012; 72: 5035-5047. Stacpoole PW, Kurtz TL, Han Z, Langaee T. Role of dichloroacetate in the treatment of genetic mitochondrial diseases. Adv Drug Deliv Rev 2008; 60: 1478-1487. Stacpoole PW, Gilbert LR, Neiberger RE, Carney PR, Valenstein E, Theriaque DW, Shuster JJ. Evaluation of long-term treatment of children with congenital lactic acidosis with dichloroacetate. Pediatrics 2008; 121: 1223-1228. Stacpoole PW, Kerr DS, Barnes C, Bunch ST, Carney PR, Fennell EM, Felitsyn NM, Gilmore RL, Greer M, Henderson GN, Hutson AD, Neiberger RE, OBrien RG, Perkins LA, Quisling RG, Shroads AL, Shuster JJ, Silverstein JH, Theriaque DW, Valenstein E. Controlled clinical trial of dichloroacetate for treatment of congenital lactic acidosis in children. Pediatrics 2006; 117: 1519-1531. Tong J, Xie G, He J, Li J, Pan F, Liang H. Synergistic antitumor effect of dichloroacetate in combination with 5-fluorouracil in colorectal cancer. J Biomed Biotechnol 2011; 740564. Feleszko W, Mlynarczuk I, Olszewska D, Jalili A, Grzela T, Lasek W, Hoser G, Korczak-Kowalska G, Jakóbisiak M. Lovastatin potentiates antitumor activity of doxorubicin in murine melanoma via an apoptosis dependent mechanism. Int J Cancer 2002; 100: 111-118. Winkelstein A. Mechanisms of immunosuppression: Effects of cyclophosphamide on cellular immunity. Blood 1973; 41: 273-284. Kutwin M, Sawosz E, Jaworski S, Kurantowicz N, Strojny B, Chwalibog A. Structural damage of chicken red blood cells exposed to platinum nanoparticles and cisplatin. Nanoscale Res Lett 2014; 9: 257. Mahmud H, Foller M, Lang F. Suicidal erythrocyte death triggered by cisplatin. Toxicology 2008; 249: 40-44.